Have you seen just how neat & clean Leabank Square looks recently?! Well - it's all down to these incredible Litter Patrollers!! Thank you so very much to Tom, Kevin, Mustafa & Brigit!! You're all making Leabank Square a beautiful place for us ALL to live in!! A great bunch of kids. It jsut show you what we can do if we ALL put our heads together. Who needs a management company? Can't we get rid of them and do it all ourselves? It would save a load of service charge. I'm ALL FOR kicking the management company up the wotsit! Anyone else recieved their service charge bill yet?! I really wouldn't mind paying - if we saw any REAL benefits!! 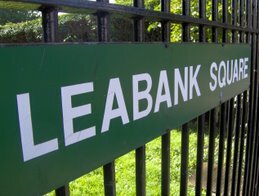 The only work that gets done here in Leabank Square is done by residents who volunteer to make the square better for everyone else. Where do I sign up to change the management company? Man - these kids are good!! I've lived in a few Hackney estates - and I've gotta say - we are very lucky to have such great kids in Leabank!